We were looking to book an adventure during our last visit to Kauai. After looking at a few different options we landed on the Kauai Stand Up Paddle Board tour from Outfitters Kauai. We chose this tour since it includes paddling and a hike. Also, we have previously done the Waimea Canyon Downhill Bike Tour with this same tour company and had a great experience. The day starts with a quick drive from the Outfitters Kauai storefront in Poipu to the The Kayak Shack at Nawiliwili Small Boat Harbor. Once at the shack, the staff provides some quick instructions and hands you the require equipment, a dry bag and your lunch. 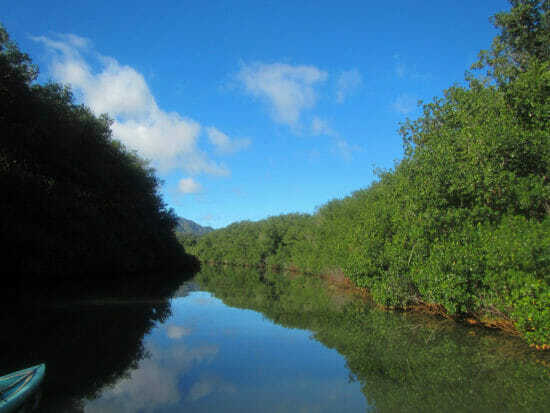 You now ready for the two mile downwind paddle tour of the Hule’ia river. This river is very quiet, surrounded by a National Wildlife Refuge, and a great place to try SUP for the first time. If you are nervous about trying SUP don’t worry! Not only is this a great place to try it out, but the instructors are great and will help you get started. Our guide was extremely knowledgeable in SUP, the history of the area, details on the vegetation around and many entertaining facts. After about 90 minutes of SUP, we left out boards in the water and started our hike. 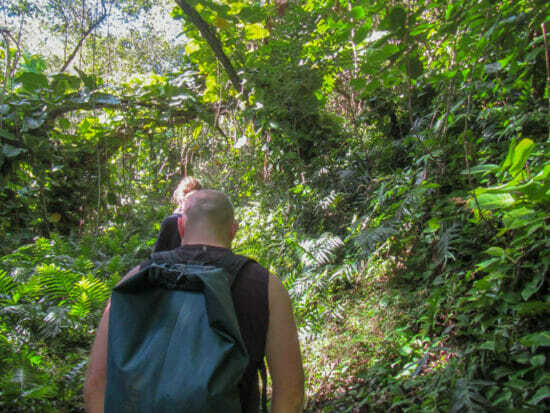 This isn’t a hike that you would be able to do on your own since it’s on private land. It’s very scenic and not too difficult. Part way through the hike, we stopped at a picnic spot to eat our lunch, that is included in your booking fee. For the curious ones, it was a sandwich, pasta salad and a sweet treat. There’s plenty of water and some fruit drinks too. After eating, we started hiking back down and stopped at the first swimming hole. This one had a short zipline and a diving platform. The water is cold, but very refreshing on a hot day. After everyone that wanted to jump had done so, we kept walking back towards our pickup spot. There is a second swimming hole that does not require a brave jump. The hike ended where it started. This is where a famous scene from one of the Indiana Jones Movies was filmed. We waited a few minutes for our ride back, a supercool motorized canoe. Before heading out on the tour I was a little nervous. I had never done SUP and wasn’t really sure what to expect, since trying to surf was disaster. Take my word for it, there was nothing to worry about. It’s fairly easy once you get the hang of it. The river was very calm and the scenery breathtaking. Outfitters Kauai recommend, a swimsuit, shorts and a t-shirt. Bring shoes that will work for hiking and mud. Don’t forget bug spray! The bugs can be brutal in the shade. Sunscreen, sunglasses and a waterproof camera are a must. 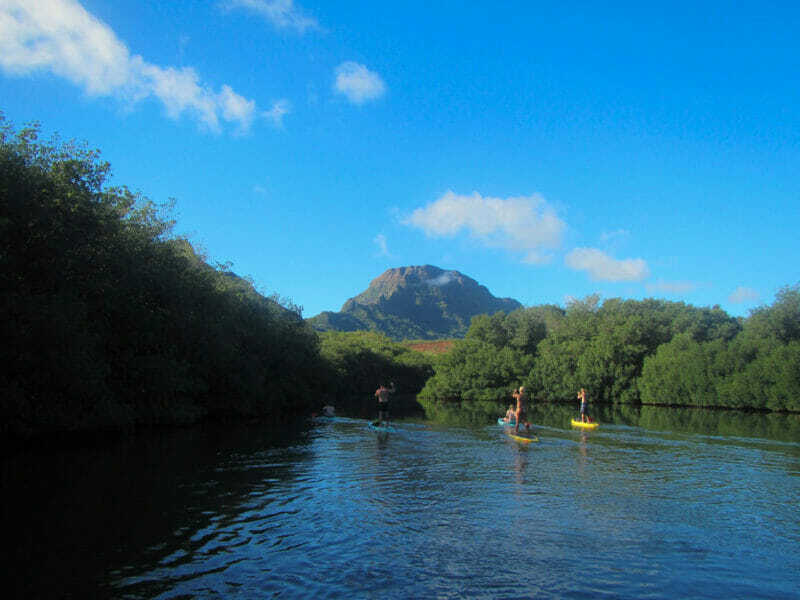 We highly recommend this Kauai Stand Up Paddle Board tour to anyone visiting Kauai, especially if you’re on the south end of the island, or wanting to try SUP for the first time. This tour makes for a pretty long day. Even though you get lunch, you will definitely want a snack once you are back. For those of you that parked at the Outfitters Kauai location in Koloa, Anake’s Juice Bar and Da Crack are in the same strip mall and both excellent choices. If it’s hot, go for the Acai Bowl at Anake’s!